Galion’s Colton Carney rounds third base after hitting a home run in the first inning of the Graders game against the Hamilton Joes on Friday at James D. Heddleson Field at Heise Park. The Joes hit three homers in a 12-6 win over Galion. 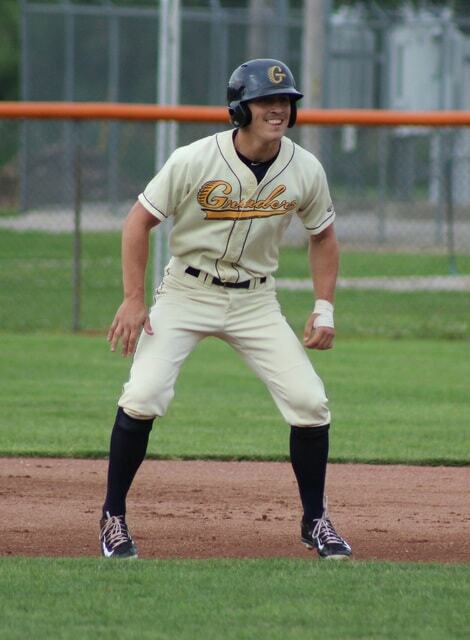 Austin Adams drove in a run for the Galion Graders during a 12-6 loss to the Hamilton Joes on Friday at James D. Heddleson Field at Heise Park. Adams is a Crestline resident and alumnus of Colonel Crawford High School. Graders first baseman Dylan Slack records a put-out during Galion’s 12-6 loss to the Hamilton Joes on Friday at James D. Heddleson Field at Heise Park. Slack had two hits and drove in a run for Galion. Nicholas Riotto of Galion takes a lead off first base during the Graders 12-6 loss to the Hamilton Joes on Friday at James D. Heddleson Field at Heise Park. Riotto had a hit and scored a run for the Graders. GALION — In the words of their namesake, the Hamilton Joes rounded third and headed for home again and again in a 12-6 victory over the Galion Graders on Friday at James D. Heddleson Field at Heise Park. The Joes (7-5), named in honor of former Cincinnati Reds pitcher Joe Nuxhall, belted three home runs and pounded 17 hits against the six Galion pitchers who saw action. Hamilton, a hard luck loser in Thursday’s game after battling back from a 6-0 deficit, left nothing to chance on Friday. Hamilton and Galion played an abbreviated version of home run derby in the first two innings. Andy Young belted a two-out solo shot over the left-field fence to give the Joes a 1-0 lead in the top of the first. Galion evened the score at 1-1 in the home half of the first when Colton Carney bashed a solo homer to nearly the same spot in left field that Young found. The big fly show continued in the second inning as Hunter Owen of Hamilton led off with yet another home run to left field. Zach Hummel slapped a one-out double to center field, which set the stage for Luke Emling’s two-run homer to left that gave the Joes a 4-1 cushion. The Graders failed to score in the bottom of the second inning and Neill was forced to turn to the bullpen earlier than he anticipated. Starter Trent Downs gave way to Matt Sullivan in the third inning. Downs (0-1) took the loss. Sullivan fared no better than Downs against the Joes, though, giving up four runs on seven hits in three innings of work. Galion (4-7) rallied in the third inning, scoring three runs to cut the Hamilton lead to 5-4. Kevin Shrock, Nicholas Riotto and Brandon Wright each recorded a basehit to load the bases for Carney, who laced a single to right field that drove in two runs. Wright, who reached base on a bunt single, scored on a ground out to shortstop by Austin Adams. Hamilton tacked on a run in the fourth and two more in the fifth off of Sullivan to build an 8-4 lead. The Joes added to Galion’s woes in the seventh, scoring four runs on six consecutive singles off Galion reliever Mitch McChristall to increase their lead to 12-4. The Graders pulled a run back in the eighth as Dylan Slack singled to score Alexander Malinsky. Galion tallied its final run in the ninth when Jake Krupar, Carney and Mark Delas each drew a walk to load the bases, and Hamilton reliever Adam Shumate was called for a balk which allowed Krupar to score. Starting pitcher Kyle Bennett (3-0) earned the win for Hamilton. He worked 6-1/3 innings, gave up four runs on six hits, and had two strikeouts and three walks. Relievers Alex Cain and Cameron Ross each gave up a run. Emling went 3-for-5 and drove in four runs to lead the Joes. Owen went 3-for-4. Young was one of five Hamilton players with two hits. Carney and Slack each had two hits for Galion. Carney drove in three runs. Slack and Adams each had a RBI. Graders reliever Josh Peterson pitched a scoreless sixth inning. Brody Basilone worked two scoreless innings and Nick Muse worked out of a jam to keep the Joes off the scoreboard in the ninth after giving up two walks. The loss snapped a two-game winning streak for the Graders, which was their second mini-win streak of the season. Neill, who doesn’t consider two in a row a streak, said he would like to see his ballclub put together a legitimate winning run. Galion plays host to the Lima Locos on Tuesday at Heise Park. First pitch is tentatively set for 7:05 p.m. Lima (6-3) is currently third in the Great Lakes Summer Collegiate League standings.